Maybe it's because of my previous experience as a scrapbook product designer, but I've always had a soft spot for designing coordinate patterns. They play such an important role in the world of scrapbooking; customers constantly look for simple patterns to complement more complicated ones on their pages. That's why nearly all scrapbook collections out there feature double-sided papers; the A-side is reserved for unique and/or busy patterns while the B-side is the place for simpler, complementing ones. You see something similar in bolt fabric lines; a few stunning hero patterns sitting next to several other simpler designs to help round out the collection. Both the scrapbooking and bolt fabric markets are unique in how much they focus on patterns when compared to other parts of the surface design industry. However, even as I've personally shifted towards more illustrative work, I still find a lot of value from including coordinates alongside hero patterns and illustrations in my portfolio. Actually, I feel it's such an important part of a well rounded portfolio, that I'm sharing 3 reasons why you should consider including them in your portfolio too! You probably already know how competitive the surface design industry is, so you should always try and package your designs to be as attractive to buyers as possible, especially because art directors want to get the most out of their budget as possible. Scenario A: You have single holiday pattern with lots of detail. Scenario B: You have that same detailed pattern sitting with 2 additional patterns that complement it. If you were the art director, which would you choose? All things being equal, you'd probably choose the option that gave you the most to work with. Try Something: Cover the 2 coordinates on the piece below and view the hero pattern on its own. Now remove your hand. Doesn't it look more enticing seeing it all packaged up like this? There are many instances in surface design where a product features multiple images or patterns together, so it's important to show buyers that you've thought about how different patterns can work together harmoniously. Now not every designer will have to understand pattern mixing (like an artist who focuses on editorial illustration for example), but if you're looking to get into a market where larger pattern collections are more common OR you're interested in taking on commissioned work from art directors that involves multiple patterns, confident pattern mixing is an important skill to develop and will make you all the more attractive to work with. This may be a much less obvious reason, but it's one I was surprised and ecstatic to discover. It wasn't until I was reviewing my notes from Surtex last year that I realized how much impact a single coordinate pattern could have. Sometimes art directors or buyers want something different, something understated, which is the perfect opportunity for simple coordinates! I had no less than half a dozen people at Surtex giving my coordinates more attention than their main pattern counterparts. Crazy right?!? I had no idea that would happen, but I'm happy I had so many designs that included coordinates. 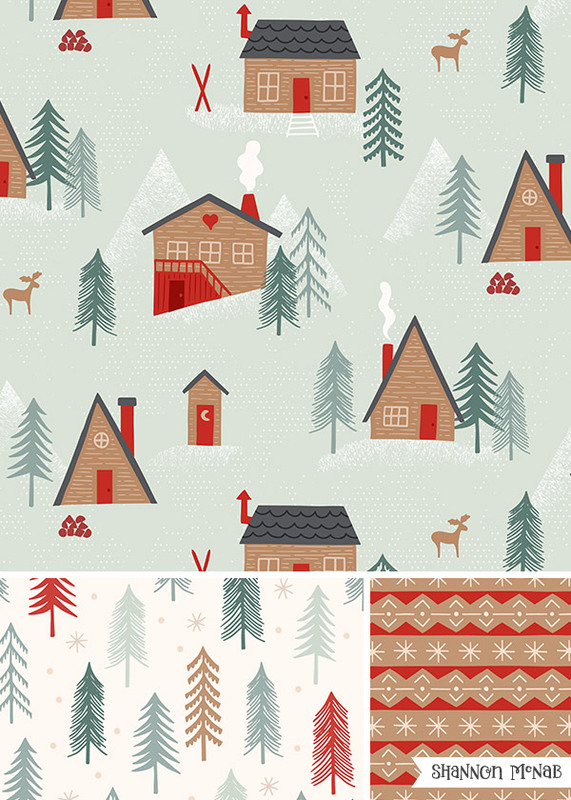 The #1 favorite coordinate of the show: the fun polka dot you see in my holiday design below. This is just another reason it's important to be able to give your client options. If I hadn't included some of my quirky coordinates alongside hero patterns on my booth banners and in my portfolio, some people I talked to at the show may have just passed my booth by. Think about those potential missed opportunities?? I hope I've convinced you how important and helpful it is to have interesting coordinate patterns in your portfolio. And I hope as you create new work, you'll consider adding some to your designs. However, I also know lots of designers struggle with creating quick, yet interesting coordinate designs to enhance their portfolios. That's why when deciding what my first Skillshare class would be, I realized this was the most helpful topic I could start with. My new class, How to Create Strong Coordinate Patterns, is just 15 minutes long so you can gain valuable insights fast and then immediately apply what you've learned to your portfolio. My class has only been online for two weeks and I'm already so overwhelmed by the positive response it's gotten! I'm elated to hear just how many designers find my insights helpful for their own creative careers. You can read all the amazing reviews of the class here. And I'm happy to say I'm already busy planning my 2nd Skillshare class! If you'd like to hear when my next class goes live you can follow me on Skillshare OR sign up for my newsletter.